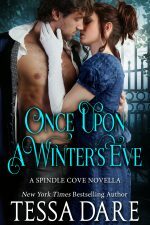 After years of fending for herself, Kate Taylor found friendship and acceptance in Spindle Cove–but she never stopped yearning for love. The very last place she’d look for it is in the arms of Corporal Thorne. The militia commander is as stone cold as he is ruggedly handsome. 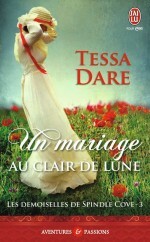 But when mysterious strangers come searching for Kate, Thorne steps forward as her fiance. He claims to have only Kate’s safety in mind. So why is there smoldering passion in his kiss? “No, thank you.” Kate sipped the weak brew in her cup, masking her grimace. The leaves were on their third use, at least. They seemed to have been washed of their last vague memory of being tea. Fitting, she supposed. Vague memories were the order of the day. Setting aside her “tea,” Kate cast a surreptitious glance at the mantel clock. Time was growing short. She despised wasting precious minutes on niceties when there were questions singeing the tip of her tongue. But abruptness wouldn’t win her any answers. As orphans went, Kate knew she’d been a great deal happier than most. The atmosphere at Margate School for Girls might have been austere, but she hadn’t been beaten or starved or unclothed. She’d formed friendships and gained a useful education. Most important of all, she’d been instructed in music and encouraged in its practice. Truly, she could not complain. Margate had provided for her every need, save one. In all her years there, she’d never known real love. Just some pale, thrice-washed dilution of it. Another girl might have grown bitter. But Kate just wasn’t formed for misery. Even if her mind could not recall it, her heart remembered a time before Margate. Some distant memory of happiness echoed in its every beat. She’d been loved once. She just knew it. She couldn’t put a name or face to the emotion, but that didn’t make it any less real. Once upon a time, she’d belonged—to someone, somewhere. This woman might be her last hope of finding the connection. No one knew Kate’s true birthday, least of all Kate herself. As schoolmistress, Miss Paringham had decided all wards of the school would share the Lord’s birthday, December 25. Supposedly they were to take comfort from this reminder of their heavenly family on the day when all the other girls had gone home to their own flesh-and-blood relations. However, Kate always suspected there’d been a more practical motive behind the choice. If their birthdays were on Christmas, there was never any need to celebrate them. No extra gifts were warranted. Wards of the school made do with the same Christmas package every year: an orange, a ribbon, and a neatly folded length of patterned muslin. Miss Paringham did not believe in sweets. Apparently she still didn’t. Kate bit a tiny corner off the dry, tasteless biscuit she’d been offered, then set it back on the plate. On the mantel, the clock’s ticking seemed to accelerate. Only twenty minutes before the last stagecoach left for Spindle Cove. If she missed the stage, she would be stranded in Hastings all night. She steeled her nerve. No more dithering. As she repeated Kate’s name, the old schoolmistress’s voice cracked. Not cracked like brittle china, but cracked like a whip. In a reflexive motion, Kate snapped tall in her chair. Miss Paringham didn’t answer, merely pressed her papery lips into a thin slash of disapproval. They regarded one another. There, now the truth was out. Kate struggled not to reveal any sign of disappointment or hurt. But her wrapped bundle of sheet music slipped to the floor—and as it did, a smug little smile curved Miss Paringham’s lips. “Wicked thing. Your shame goes without saying. God Himself has marked you.” Miss Paringham pointed with a bony finger. Kate couldn’t even reply. She raised her own trembling hand to her temple. With her fingertips, she began to idly rub the mark, the same way she’d done as a young girl—as if she might erase it from her skin. Her whole life, she’d believed herself to be a loved child whose parents had met an untimely demise. How horrid, to think that she’d been cast away, unwanted. Her fingers stilled on her birthmark. Perhaps cast away because of this. Kate told herself to stay calm. Clearly, Miss Paringham was a lonely, warped old woman who now lived to make others miserable. She would not give the beastly crone the satisfaction of seeing her rattled. But she would not stay here a moment longer, either. The old woman lashed out with her cane, striking Kate in the back of the knees. Kate braced her shoulder on the doorjamb. The sting of humiliation was far greater than the physical pain. Part of her wanted to crumple into a tiny ball on the floor, but she knew she had to flee this place. More than that, she had to flee these words. These horrible, unthinkable notions that could leave her marked inside, as well as out. “Good day, Miss Paringham.” She placed weight on her smarting knee and drew a quick breath. The front door was just paces away. Someone, Kate’s heart insisted. Someone, somewhere. “No one.” Malice twisted the old woman’s face as she swung the cane again. Kate heard its crisp whack against the doorjamb, but by that time, she was already wrestling open the front latch. She picked up her skirts and darted out into the cobbled street. Her low-heeled boots were worn thin on the soles, and she slipped and stumbled as she ran. The streets of Hastings were narrow and curved, lined with busy shops and inns. There was no possible way the sour-faced woman could have followed her. She ran with hardly a care for which direction she was going, so long as it was away. Perhaps if she kept running fast enough, the truth would never catch up. As she turned in the direction of the mews, the booming toll of a church bell struck dread in her gut. Oh no. Stop there. Please don’t toll again. Her heart flopped. Miss Paringham’s clock must have been slow. She was too late. The coach would have already departed without her. There wouldn’t be another until morning. Summer had stretched daylight to its greatest length, but in a few hours, night would fall. She’d spent most of her funds at the music shop, leaving only enough money for her passage back to Spindle Cove—no extra coin for an inn or a meal. Kate came to a standstill in the crowded lane. People jostled and streamed about her on all sides. But she didn’t belong to any of them. None of them would help. Despair crawled its way through her veins, cold and black. Her worst fears had been realized. She was alone. Not just tonight, but forever. Her own relations had abandoned her years ago. No one wanted her now. She would die alone. Living in some cramped pensioner’s apartment like Miss Paringham’s, drinking thrice-washed tea and chewing on her own bitterness. Her whole life she’d clung to the memory of those words. She’d held fast to the belief that they meant someone, somewhere cared. She wouldn’t let that voice down. This sort of panic wasn’t like her, and it wouldn’t do a bit of good. She closed her eyes, drew a deep breath, and took a silent inventory. She had her wits. She had her talent. She had a young, healthy body. No one could take these things from her. Not even that cruel, shriveled wench with her cane and weak tea. There had to be some solution. Did she have anything she could sell? Her pink muslin frock was rather fine—a handed-down gift from one of her pupils, trimmed with ribbon and lace—but she couldn’t sell the clothes off her back. She’d left her best summer bonnet at Miss Paringham’s, and she’d rather sleep in the streets than retrieve it. If she hadn’t cut it so short last summer, she might have tried to sell her hair. But the locks barely reached below her shoulders now, and they were an unremarkable shade of brown. No wigmaker would want it. Her best chance was the music shop. Perhaps if she explained her predicament and asked very nicely, the proprietor would accept his music back and return her money. That would afford her enough for a room at a somewhat respectable inn. Staying alone was never advisable, and she didn’t even have her pistol. But she could prop a chair beneath her door and stay awake all night, clutching the fireplace poker and keeping her voice primed to scream. There. She had a plan. As Kate started to cross the street, an elbow knocked her off balance. She whirled away, apologizing. The twine on her parcel snapped. White pages flapped and fluttered into the gusty summer afternoon, like a covey of startled doves. She made wild sweeps with both hands. A few pages disappeared down the street, and others fell to the cobblestones, quickly trampled by passersby. But the bulk of the parcel landed in the middle of the lane, still wrapped in brown paper. She made a lunging grab for it, desperate to save what she could. “Look sharp!” a man shouted. Cartwheels creaked. Somewhere much too near, a horse bucked and whinnied. She looked up from where she’d crouched in the lane to see two windmilling, iron-shoed hooves, big as dinner plates, preparing to demolish her. Kate threw her weight to one side. The horse’s hooves landed just to her left. With a squalling hiss of the brake, a cartwheel screeched to halt—inches from crushing her leg. The parcel of sheet music landed some yards distant. Her “plan” was now a mud-stained, wheel-rutted smear on the street. As he raised his whip for another strike, Kate flinched and ducked. Chilling, those words. But effective. The cart swiftly rolled away. As strong arms pulled her to her feet, Kate’s gaze climbed a veritable mountain of man. She saw black, polished boots. Buff breeches stretched over granite thighs. A distinctive red wool officer’s coat. On another day, Kate could have laughed at the irony. Of all the men to come to her rescue, it would be this one. Silly, foolish, shame-marked, unwanted me. She turned away, unable to bear the chastisement in his gaze. Hardly poetry, those words. A simple statement of fact. They scarcely shared the same alphabet as kindness. If true comfort were a nourishing, wholemeal loaf, what he offered her were a few stale crumbs. It didn’t matter. It didn’t matter. She was a starving girl, and she hadn’t the dignity to refuse. And with that, Kate fell into his immense, rigid, unwilling embrace—and wept. She burst into tears. Right there in the street, for God’s sake. Her lovely face screwed up. She bent forward until her forehead met his chest, and then she heaved a loud, wrenching sob. Then a second. And a third. His gelding danced sideways, and Thorne shared the beast’s unease. Given a choice between watching Miss Kate Taylor weep and offering his own liver to carrion birds, he would have had his knife out and sharpened before the first tear rolled down her face. He clucked his tongue softly, which did some good toward calming the horse. It had no effect on the girl. Her slender shoulders convulsed as she wept into his coat. His hands remained fixed on her arms. In a desperate gesture, he slid them up. Then down. What’s happened? he wanted to ask. Who’s hurt you? Who can I maim or kill for distressing you this way? “I’m sorry,” she said, pulling away after some minutes had passed. She paled and stopped talking. He took the horse’s lead in one hand and laid the other hand to Miss Taylor’s back, guiding her out of the street. Once they reached the side of the lane, he looped his horse’s reins about a post and turned his sights toward making her comfortable. There wasn’t anywhere for her to sit. No bench, no crate. This disturbed him beyond reason. His gaze went to a tavern across the street—the sort of establishment he’d never allow her to enter—but he was seriously considering crossing the lane, toppling the first available drunk off his seat, and dragging the vacated chair out for her. A woman shouldn’t weep while standing. It didn’t seem right. Curse it. How was he going to remedy this situation? He easily had the money to hire another horse, but nowhere near enough coin in his pocket for a private carriage. He could put her up in an inn—but damned if he would let her stay alone. A dangerous thought visited him, sinking talons into his mind. He could stay with her. Not in a tawdry way, he told himself. Just as her protector. He could find a damned place for her to sit down, as a start. He could see that she had food and drink and warm blankets. He could stand watch while she slept and make certain nothing disturbed her. He could be there when she woke. After all these months of frustrated longing, maybe that would be enough. “Good heavens.” She took a sudden step back. “No, it’s not.” Thorne conducted a quick, silent assessment of his personal equipment. He found all to be under regulation. On another occasion—one with fewer tears involved—this degree of closeness would have undoubtedly roused his lust. But today she was affecting him rather higher in his torso. Tying his guts in knots and poking at whatever black, smoking cinder remained of his heart. Oh. That. In all the commotion, he’d nearly forgotten the creature. He reached beneath the leather flap and withdrew the source of the wriggling, holding it up for her to see. And suddenly everything was different. It was like the whole world took a knock and tilted at a fresh angle. In less time than it took a man’s heart to skip, Miss Taylor’s face transformed. The tears were gone. Her elegant, sweeping eyebrows arched in surprise. Her eyes candled to life—glowed, really, like two stars. Her lips fell apart in a delighted gasp. She smiled. Lord, how she smiled. All because of this wriggling ball of snout and fur that was as likely to piss on her slippers as chew them to bits. As if he could refuse. Thorne placed the pup in her arms. She lifted the pup in both hands and looked it nose-to-nose, puckering her lips to make a little chirping noise. The dog licked her face. The dog yipped. She laughed and drew it close to her chest, bending over its furry neck. Thorne felt a sharp twist in his chest. Like something rusted and bent, shaking loose. This girl had a way of doing that—making him feel. She always had done, even years upon years in the past. That long-ago time seemed to fall beyond the reach of her earliest memories. A true mercy for her. But Thorne remembered. He remembered it all. She bit her lip, looking unsure. Her instinctive resistance to the idea was plain. And understandable. Thorne wasn’t overeager to put his plan into action, either. Three hours astride a horse with Miss Kate Taylor nestled between his thighs? Torture of the keenest sort. But he could see no better way to have her swiftly and safely home. He could do this. If he’d lasted a year with her in the same tiny village, he could withstand a few hours’ closeness. Her mouth quirked in a droll, self-conscious smile. It was reassuring to see, and at the same time devastating. For God’s sake, don’t say that. “Thank you,” she added. She laid a gentle touch to his sleeve. For your own sake, don’t do that. He pulled away from her touch, and she looked hurt. Which made him want to soothe her, but he didn’t dare try. “Mind the pup,” he said. Thorne helped her into the saddle, boosting her at the knee, rather than the thigh, as might have been more efficient. He mounted the gelding, taking the reins in one hand and keeping one arm about her waist. As he nudged the horse into a walk, she fell against him, soft and warm. His thighs bracketed hers. Her hair smelled of clover and lemon. The scent rushed all through his senses before he could stop it. Damn, damn, damn. He could discourage her from talking to him, touching him. He could keep her distracted with a dog. But how could he prevent her from being shaped like a woman and smelling like paradise? Thorne knew, without a doubt, the next three hours would be the harshest punishment of his life. 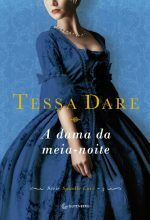 And here’s “The Manufatuation” translated into Portuguese!